Every light twin engine airplane checkout should include a demonstration of the airplane's engine out minimum control speed. The engine out minimum control speed given in the FAA approved Airplane Flight Manual, Pilot's Operating Handbook, or other manufacturer's published limitations is determined during original airplane certification under conditions specified in the Federal Aviation Regulations. These conditions normally are not duplicated during pilot training or testing because they consist of the most adverse situations for airplane type certification purposes. Prior to a pilot checkout, a thorough discussion of the factors affecting engine out minimum control speed is essential. Basically, when one engine fails the pilot must overcome the asymmetrical thrust (except on airplanes with center line thrust) created by the operating engine by setting up a counteracting moment with the rudder. When the rudder is fully deflected, its yawing power will depend on the velocity of airflow across the rudder - which in turn is dependent on the airspeed. As the airplane decelerates it will reach a speed below which the rudder moment will no longer balance the thrust moment and directional control will be lost. During engine out flight the large rudder deflection required to counteract the asymmetric thrust also results in a "lateral lift" force on the vertical fin. This lateral "lift" represents an unbalanced side force on the airplane which must be counteracted either by allowing the airplane to accelerate sideways until the lateral drag caused by the sideslip equals the rudder "lift" force or by banking into the operative engine and using a component of the airplane weight to counteract the rudder induced side force. In the first case, the wings will be level, the ball in the turn and slip indicator will be centered and the airplane will be in a moderate sideslip toward the inoperative engine. In the second case, the wings will be banked 3 to 5 degrees into the good engine, the ball will be deflected one diameter toward the operative engine, and the airplane will be a zero sideslip. The sideslipping method has several major disadvantages: (1) the relative wind blowing on the inoperative engine side of the vertical fin tends to increase the asymmetric moment caused by the failure of one engine; (2) the resulting sideslip severely degrades stall characteristics; and (3) the greater rudder deflection required to balance the extra moment and the sideslip drag cause a significant reduction in climb and/or acceleration capability. Flight tests have shown that holding the ball of the turn and slip indicator in the center while maintaining heading with wings level drastically increases Vme as much as 20 knots in some airplanes. (Remember, the value of Vmc given in the FAA approved flight manual for the airplane is based on a maximum 5 degree bank into the operative engine.) Banking into the operative engine reduces Vmc, whereas decreasing the bank angle away from the operative engine increases Vmc at the rate of approximately 3 knots per degree of bank angle. Flight tests have also shown that the high drag caused by the wings level, ball centered configuration can reduce single engine climb performance by as much as 300 FPM, which is just about all that is available at sea level in a nonturbocharged light twin. Banking at least 5 degrees into the good engine ensures that the airplane will be controllable at any speed above the certificated Vmc, that the airplane will be in a minimum drag configuration for best climb performance, and that the stall characteristics will not be degraded. Engine out flight with the ball centered is never correct. The magnitude of these effects will vary from airplane to airplane, but the principles are applicable in all cases. NOTE - A bank limitation of up to 5 degrees during Vmc demonstration is applicable only to certification tests of the airplane and is not intended as a limit in training or testing a pilot's ability to extract maximum performance from the airplane. For an airplane with nonsupercharged engines, Vmc decreases as altitude is increased. Consequently, directional control can be maintained at a lower airspeed than at sea level. The reason for this is that since power decreases with altitude the thrust moment of the operating engine becomes less, thereby lessening the need for the rudder's yawing force. Since Vmc is a function of power (which decreases with altitude), it is possible for the airplane to reach a stall speed prior to loss of directional control. It must be understood, therefore, that there is a certain density altitude above which the stalling speed is higher than the engine out minimum control speed. When this density altitude exists close to the ground because of high elevations or temperatures, an effective flight demonstration is impossible and should not be attempted. When a flight demonstration is impossible, the check pilot should emphasize orally the significance of the engine out minimum control speed, including the results of attempting flight below this speed with one engine inoperative, the recognition of the imminent loss of control, and the recovery techniques involved. Vmc is greater when the center of gravity is at the rearmost allowable position. Since the airplane rotates around its center of gravity, the moments are measured using that point as a reference. A rearward CG would not affect the thrust moment, but would shorten the arm to the center of the rudder's horizontal "lift" which would mean that a higher force (airspeed) would be required to counteract the engine out yaw. 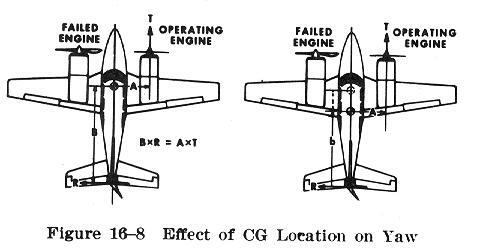 Figure 16-8 shows an exaggerated view of the effects of a rearward CG. Generally, the center of gravity range of most light twins is short enough so that the effect on the Vmc is relatively small, but it is a factor that should be considered. Many pilots would only consider the rear CG of their light twin as a factor for pitch stability, not realizing that it could affect the controllability with one engine out. There are many light twin pilots who think that the only control problem experienced in flight below Vmc is a yaw toward the inoperative engine. Unfortunately, this is not the whole story. With full power applied to the operative engine, as the airspeed drops below Vmc, the airplane tends to roll as well as yaw into the inoperative engine. This tendency becomes greater as the airspeed is further reduced. Since this tendency must be counteracted by aileron control, the yaw condition is aggravated by aileron yaw (the "down" aileron creates more drag than the "up" aileron). If a stall should occur in this condition, a violent roll into the dead engine may be experienced. Such an event occurring close to the ground could be disastrous. This may be avoided by maintaining airspeed above Vmc at all times during single engine operation. If the airspeed should fall below Vmc - for whatever reason - then power must be reduced on the operative engine and the airplane must be banked at least 5 degrees toward the operative engine if the airplane is to be safely controlled. The Vmc demonstrations should be performed at an altitude from which recovery from loss of control could be made safely. One demonstration should be made while holding the wings level and the ball centered, and another demonstration should be made while banking the airplane at least 5 degrees toward the operating engine to establish "zero sideslip." These maneuvers will demonstrate the engine out minimum control speed for the existing conditions and will emphasize the necessity of banking into the operative engine. No attempt should be made to duplicate Vmc as determined for airplane certification. After the propellers are set to high RPM, the landing gear is retracted, and the flaps are in the takeoff position, the airplane should be placed in a climb attitude and airspeed representative of that following a normal takeoff. With both engines developing as near rated takeoff power as possible, power on the critical engine (usually the left) should then be reduced to idle (windmilling, not shut down). After this is accomplished, the airspeed should be reduced slowly with the elevators until directional control no longer can be maintained. At this point, recovery should be initiated by simultaneously reducing power on the operating engine and reducing the angle of attack by lowering the nose. Should indications of a stall occur prior to reaching this point, recovery should be initiated immediately by reducing the angle of attack. In this case, a minimum engine out control speed demonstration is not possible under existing conditions. If it is found that the minimum engine out control speed is reached before indications of a stall are encountered, the pilot should demonstrate the ability to control the airplane and initiate a safe climb in the event of a power failure at the published engine out minimum control speed.